Ice cream. ICE CREAM. IIICCEE CRREEEEAAAAAMM!!! Sorry, I’ll try to contain myself from now on, I’m just a little (read: extremely) excited to share this recipe. Vanilla Bean Ice Cream is an all-time classic… and now it’s been made totally, utterly, and completely guilt-free with this Healthy Vanilla Protein Ice Cream recipe. This sweet and creamy, mouthwatering amazingness is refined sugar free, low carb, low fat, and high protein, but you would NEVER ever ever suspect it. Ohhhh yes. I worked pretty darn hard to perfect this recipe. It required three trials to get just the right flavor, texture, and amazing nutrition label. But it was so, so worth it. In my first trial, I tried to make a no-churn ice cream by blending all of the ingredients in a blender, pouring everything into a ceramic loaf pan, then freezing until firm. Sadly, it froze into a rock hard brick, and even after thawing it for a while, each scoop was super icy and crystallized. In the second trial, I gave up on the no-churn ice cream idea and used my ice cream maker. The texture was spot on, but it wasn’t flavorful enough and could be a bit sweeter. In the third (and final) trial, I added more stevia extract and some more Homemade Vanilla Paste. To achieve that “true” ice cream flavor, I also added a tiny bit of butter flavoring. My first bite? FOODGASM ON A SPOON. 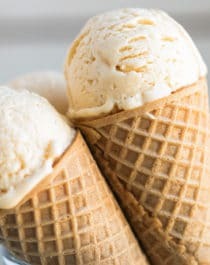 This Healthy Vanilla Protein Ice Cream is delectable all on its own, sandwiched in between two Peanut Butter Oatmeal Cookies, on top of a warm slice of Citrus Pound Cake, added to a Red Velvet Smoothie to transform it into a milkshake, or served alongside some Homemade Maraschino Cherries! No matter how you serve this sugar free ice cream, you’ll be glad you did. This Vanilla Protein Ice Cream is sweet, creamy, mouthwatering amazingness! Oh, and it's refined sugar free, low carb, low fat, and high protein too! In a blender, add the yogurt, milk, vanilla paste, stevia extract, and butter flavor. Blend until smooth. In a small bowl, whisk together the protein powder, xanthan gum, and salt. With the blender running, slowly add in the dry ingredients. Blend until smooth. After freezing solid, I find the best way to "thaw" the ice cream is in the fridge for a couple hours, rather than sitting on the counter or some time in the microwave. WHHHHAAAT?!?!?!? CAN YOU BELIEVE IT??? Only 150 calories, .5g fat, and 10g of carbs PER CUP! I really couldn’t ask for more. Actually yes, I could — I could most certainly ask for another bowl full of this Healthy Vanilla Protein Ice Cream. If you stopped buying ice cream from the grocery store, you sure won’t be missing out on anything with this Healthy Vanilla Protein Ice Cream — it’s perfectly scoopable and totally creamy, just like storebought ice creams. The only difference is that this heavenly goodness is made without the added sugar, heavy cream, and eggs. BOOM. Happy birthday! I hope you still enjoy it. I once went to exam prep for the whole day on my b-day. I didn’t get to make myself delicious healthy ice cream like you so it looks like you’re having a good birthday to me. Just go out and celebrate later ok? Kat, exam prep for a whole day?! 🙁 I wish I could’ve shared my ice cream with you! Happy Birthday! Thanks for procrastinating and making this healthy vanilla ice cream 😉 It looks super good! Out of all the ice cream I’ve made I have for some reason never made my favorite classic – vanilla. This recipe looks delicious. Ah! I’m late to the party on this one, but HAPPY BIRTHDAYYYYY!!! And oh my gosh this recipe looks awesome! I’ve been craving ice cream like mad because the supermarket stuff is filled with high fructose corn syrup, or a ton of cream. But this looks amazing! I can’t wait to try it ^_^. CANNOT WAIT TO MAKE THIS. BUT…Can I use almond milk in place of the •one 12oz can Evaporated Fat Free Milk? I’ve never had luck using almond milk in ice cream. It turns things super icy. Evaporated milk has a lower water content compared to almond milk, which is why this ice cream is creamy, so I wouldn’t recommend subbing it. Hi. I followed the recipe pretty closely. Froze the ice-cream bowl for more than 24hours and used all the same ingredients MINUS the evaporated milk and the whey. I used soy milk instead and since I was out of whey, I used vegan protein powder. There’s a big difference between whey protein and vegan protein… vegan protein thickens much more than whey! Was your ice cream “batter” pourable like a thick smoothie? That’s what the texture should be like. Also, what size ice cream maker do you have? I used a 2-quart ice cream maker, which was plenty. yes,it was pourable like a thick smoothie – in fact, that’s what it made me think of. It’s 2-quart as well! To the brim it went! That’s strange… how long did you churn it for? Not sure why then, maybe it needed a few more minutes or maybe it was the vegan protein powder. If you churned it as best you could, you could probably just scoop the churned soft serve into the dish you’re freezing it in and continue on with the recipe. I’m so happy to have found your site! I’ve been making myself content with the Vita-mix “ice-cream” while losing weight – essentially milk, ice, powdered milk, and I swap the sugar for the stevia blend and just choose to be happy lol. I can’t wait to try your other recipes. That’s so funny! I am lobbying my husband for an ice cream maker so I can try your recipe!